Visit the web page found at http://www.thedorsalfin.com/shark-news-stories/story-behind-recent-great-white-shark-guadalupe-pics-appearing-in-multiple-media-outlets/ for the story behind recent white pointer shark photos in the media (i.e. The Advertiser 11/3/10). 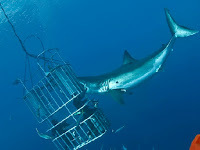 Underwater photographer Don Carpenter explained On "The CBS Early Show" that this great white shark wasn't attacking the cage at all, rather that it was being "wrangled" to help the photographer achieve the best photo angle. Photos can also be viewed at http://www.cbsnews.com/2300-500202_162-10002779.html. Further details can be found at http://www.cbsnews.com/stories/2010/03/12/earlyshow/living/petplanet/main6292577.shtml?tag=contentMain;contentAux.